Be inspired by its charming countryside, historic influence, and natural surroundings! In the hills of western Chenango County, you will find the charming little town of McDonough, NY, embraced by state forests, and sprinkled with country homes. McDonough visitors, along with its residents in this southern-tier region, enjoy beautiful views, fun in the summer sun, fall colors, and loads of snowy winter play. This historic township remains a serene oasis, with a few business exceptions, due to a series of natural events years ago which ultimately suppressed the expansion of urban development. The preserved natural beauty today attracts many artists, outdoor sports enthusiasts, families, and those seeking a peaceful refuge. A couple of unexpected gems are the exotic Palyul Ling International Retreat Center, a Buddhist monastery, and the sylvan retreat, Bowman Lake State Park, a family oriented campground which offers something for everyone. 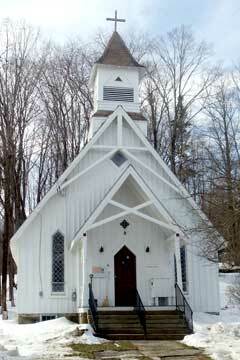 A strong community ethic keeps treasured structures useful like the historic Calvary Church which is now the library. With its fortunate location, it's just a short trip to peak tourist attractions within about a 60-mile radius of the major cities of Binghamton (32 miles), Oneonta (50 mi), and both Syracuse and Cooperstown (62 mi). 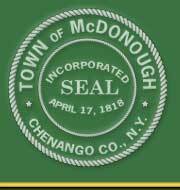 McDonough town has a long history, having been settled around the 1790's, as the original 13th township of the twenty in Chenango County. In 1793, the McDonough real estate was 24,218 acres, and it was sold for 3 shillings 5 pence per acre to a pair of enterprising fellows by the names of Thomas Ludlow and Josiah Shipperly. The two prospectors then resold the land in 200 acre lots; however, they invested personally in the land as well. Ludlow, in 1798 set up the first sawmill at the foot of Lake Ludlow and he started the first store in 1802. 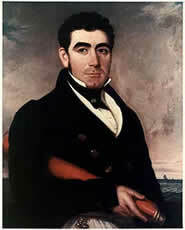 In 1799, Moore established the first inn. In the early 1800's, the water power generated by the Genegantslet Lake, in the northwest part of the town, was a draw for industry. In 1865, the population of McDonough was a booming 1,306, and its area 23,853 acres. For awhile, business flourished there with several stores, a hotel, a tailor shop, a harness shop, a flouring mill, saw mills, tanneries, blacksmith shops, and carriage shops. Unfortunately, just a few years later, in 1869, the dam at the McDonough Reservoir broke and washed away all the mills and many businesses. Some mills rebuilt, but the flood of 1935 did them in. Today, the Genegantslet Lake is privately-owned and maintained. There have been some businesses, but McDonough is more of a residential and recreational area now. The famous secular music composer and poet, John Prindle Scott (1877-1932), called McDonough home for several years late in his life. First he spent some summers there, then in 1922, he purchased a house in the village he called his "Scottage". Truly inspired, his McDonough poetry includes, "The Old Road", and his special ode, "The Hills O' McDonough," for the place he dearly loved. From 1919 to 1979 McDonough was home to the famed 'Ford Homes', the Ivon R. Ford, Inc., prefab house factory. Started and owned by Ivon R. Ford, Sr., it was one of the first manufacturers of prefabricated buildings in the country and a major employer. Today, McDonough still offers plenty of opportunities for creative, free thinking entrepreneurs. Established businesses are service and manufacturing oriented, but the peaceful beauty of the area attracts a unique artistic community who find McDonough conducive for a vast assortment of personal expression. There are crafters of pottery to furniture and artists who sculpt, draw, paint (-even one-of-a-kind "paintings" with a torch on copper), take photographs and writers of literature. Current day musicians also call McDonough home, like composer-guitarist-recording artist, Tom Rasely, who has even performed twice at the White House. Some authors from McDonough are Suzanne Bloom, writer and illustrator of children's books; Ann Mohin, best known for The Farm She Was: a novel; Kimberly Phillips Reihl whose first published book is a fantasy taking place in the north McDonough woods called The North Wind (under Kimberly Ann); and (mostly) horror-genre writer Dustin Warburton, who has recently added screenwriter to his resumé since Spiders in 3D is coming to the big screen! Community support is a strong point and the McDonough Improvement Committee (MIC) is a fine example of this wonderful asset. The MIC takes pride in the decorating and promoting of McDonough's world renowned largest (at 115'), living, annually lighted (since 1927) Christmas tree! For musical enjoyment, they have organized summer dance concerts at the Firehouse by Red Raville's Big Band Sounds. They also can be credited with converting the decommissioned, 123-year-old Calvary Episcopal Church into The Calvary Community Center and McDonough Library at 115 Co Rd 7. This all-volunteer, official branch of the Oxford Memorial Library, is part of the Four County Library System. The "great outdoors" expresses McDonough perfectly due to its exceptional fishing and recreational areas - some of the best in New York State. All year-round there are wonderful opportunities to get outside and have fun. Known as "a campers paradise", Bowman Lake State Park, which opened in 1966, offers swimming, sunbathing, picnicking, fishing year-round, boating, camping, bicycling and year-round hiking. Bowman lake is regularly stocked with trout, and birdwatchers can spot as many as 103 species of birds. The park also has a nature center. In winter, snowmobilers and cross-country skiers enjoy outstanding scenery on eight miles of designated trails. In other parts, there are private lakes, and more stocked fishing ponds and streams. More hiking can be done along the Finger Lakes Hiking Trail as it winds its way though the picturesque countryside. For hunting, the thick forests teem with a variety of small and large game animals. Out of the woods and along the rolling hills, you'll see cattle, horses, and sheep dotting the meadows and the smell of fresh cut hay fills the air. McDonough was once a large dairying town, but like most of the state, agriculture is on the decline due to the difficult economy. There are still a couple of producing dairy farms shipping milk, but McDonough is actively encouraging farming! What-ever the produce, may it be apples, vegetables, crops or maple syrup, full-time farms or summer havens; McDonough established a "right to farm" protection to lead to a healthier environment. All of McDonough is legally registered as an Agricultural District offering benefits to anyone that operates an agricultural business - including orchards and vineyards. The friendly community of McDonough welcomes those who meander in along 220, and find themselves at the junction of County Roads 5, 7, and 8. That's where you'll find this hamlet; come and enjoy the abundance of its natural beauty.